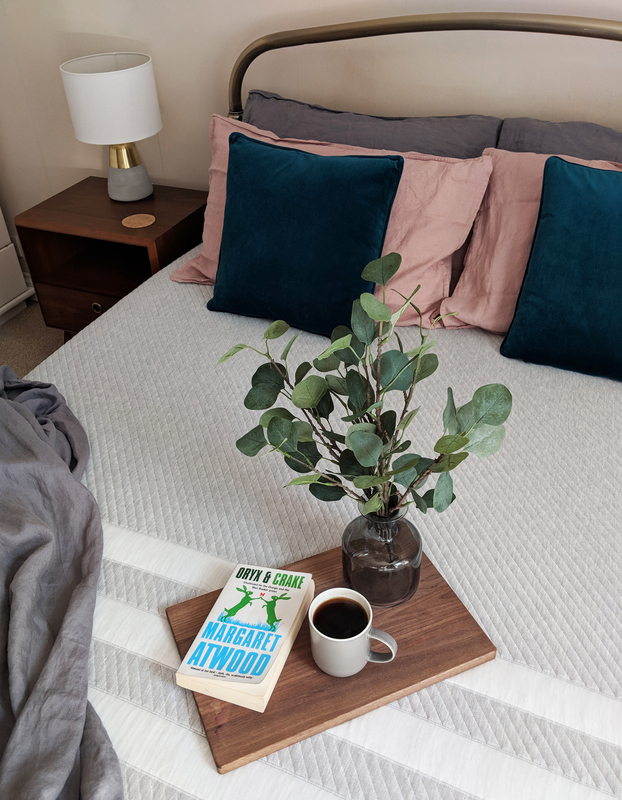 When we moved into our new home last month, the first item we unpacked was our brand new king size Leesa mattress. 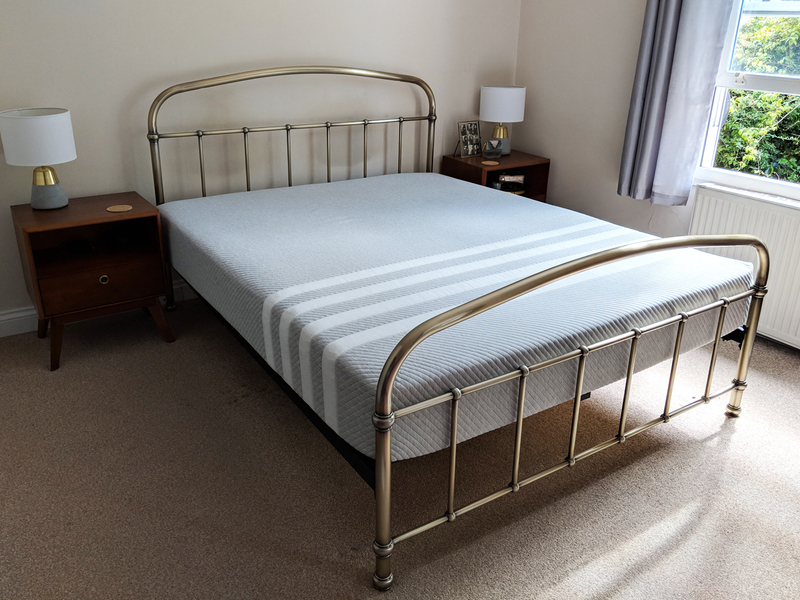 Ahead of the move, we decided we wanted to upgrade from our trusty double bed to a more spacious and comfortable king size. We found a new bed frame fairly quickly, and settled upon Leesa for our new mattress. If you haven’t heard of Leesa before, they are company specialising in comfortable mattresses, pillows and bed linen. The company’s founding members had had trouble sleeping, and like us, they had tried a variety of mattresses – memory foam, coil – but found that none were quite right for them. 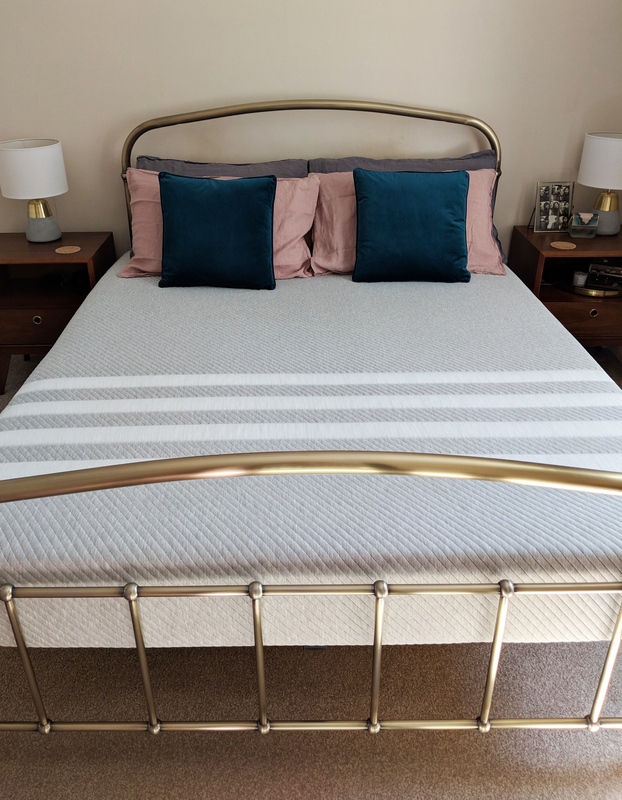 I have had a memory foam mattress for many years, but it wasn’t until I moved in with Stew, that I realised my mattress wasn’t perfect for both of us. He’s had trouble sleeping for months, and it was made worse after he had a neck injury. At the time, his Osteopath advised us to change our mattress and pillows. Having now owned the Leesa for just over a month, Stew has been sleeping much better. Not only is the king size now big enough for him to stretch out (he’s 6 foot 2), but the mattress itself is so comfortable, that we’ve both slept soundly each night. The Leesa mattress is a completely redesigned mattress offering what they call a ‘Universal Adaptive Feel’, that adapts to all body shapes/sizes and sleeping styles. This is particularly useful for couples like us who sleep very differently. Whilst I like to curl up, Stew prefers to stretch out, and whilst I can sleep solidly all night in one position, Stew is a bit (a lot) of a fidget! Each side of the mattress adapts differently to each of us. 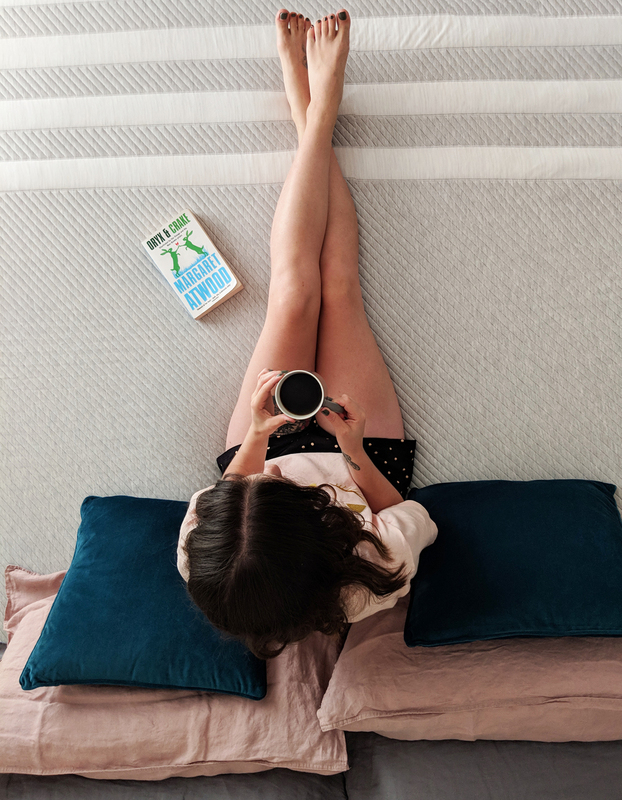 Looking closer at the technical aspect, the Leesa mattress is unique because it offers a combination of performance foam layers, which help deliver cooling bounce, contouring pressure relief and core support for the perfect night’s sleep. 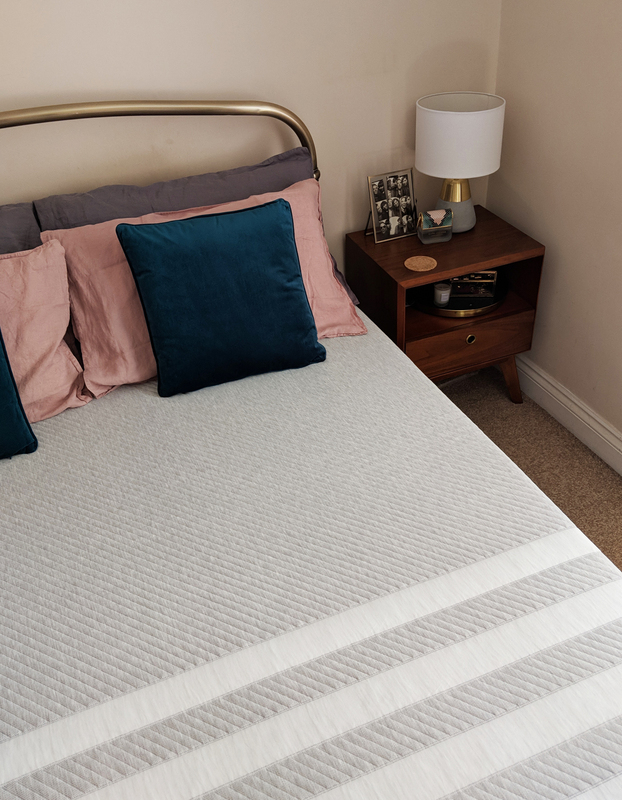 The 5cm top layer of foam provides air flow for a cooler night’s sleep, whilst the memory foam layer offers contouring as you would expect from memory foam, and finally the 15cm base layer of foam adds structure and overall support to the mattress. I believe that it’s a combination of this top layer and bottom layer, that has helped us achieve a better night’s sleep. For me the mattress feel incredibly comfortable, and it suits my sleep pattern (of barely moving) perfectly. Whilst it’s cooling top layer has helped Stew achieve a deeper night’s sleep, and the chunky base layer has helped offer the support he needs. In terms of style, although we will of course cover it with a sheet, the mattress itself is rather beautiful. 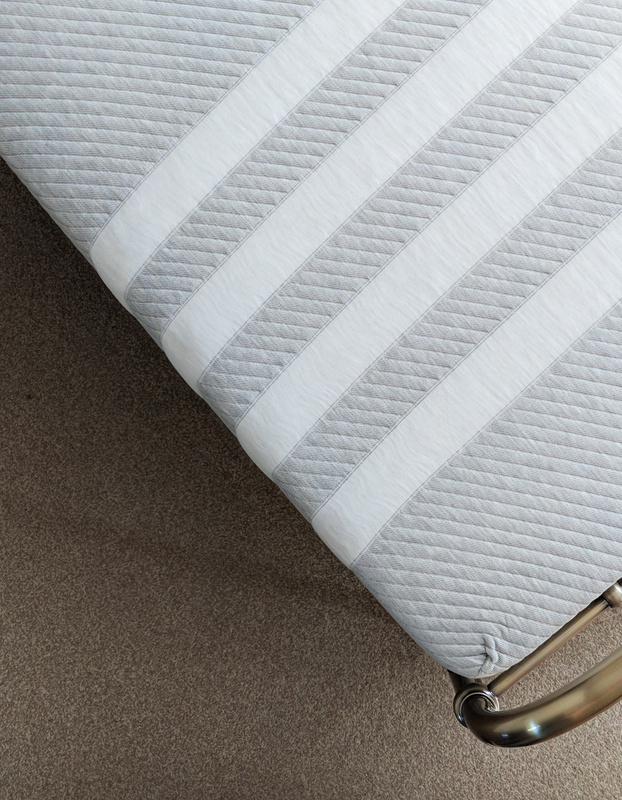 In a soft grey, with white stripes at the bottom of the mattress, it looks good and makes it easy to understand which way the mattress is supposed to lie (white stripes at the bottom of the bed). The soft colourings, help it to be masked easily by any colour sheet, including white. When our Leesa mattress arrived, it was expertly packaged in a large box, and as you removed the mattress from the box, it slowly expanded. I hadn’t had a mattress like this before, and when we first received the delivery, I did wonder, just how they had managed to squeeze a king size mattress into such a relatively small box. By it being packaged in this way, it meant that it was easy to transport from our previous flat to our new home. It even features handy instructions on how to get it out of the box, so that it fits perfectly and easily onto your bed frame. It’s best to keep the mattress in the box until you’re next to the bed, and then gently life the mattress out onto the middle of the bed. Unboxing it on its side, means the mattress will then roll out easily, and by removing the plastic casing, you can stand back and watch your Leesa mattress slowly rise. Aside from the comfortable night’s sleep, we’ve both had, what attracted me to Leesa was the fact that they donate one mattress to charity, for every ten that they sell. 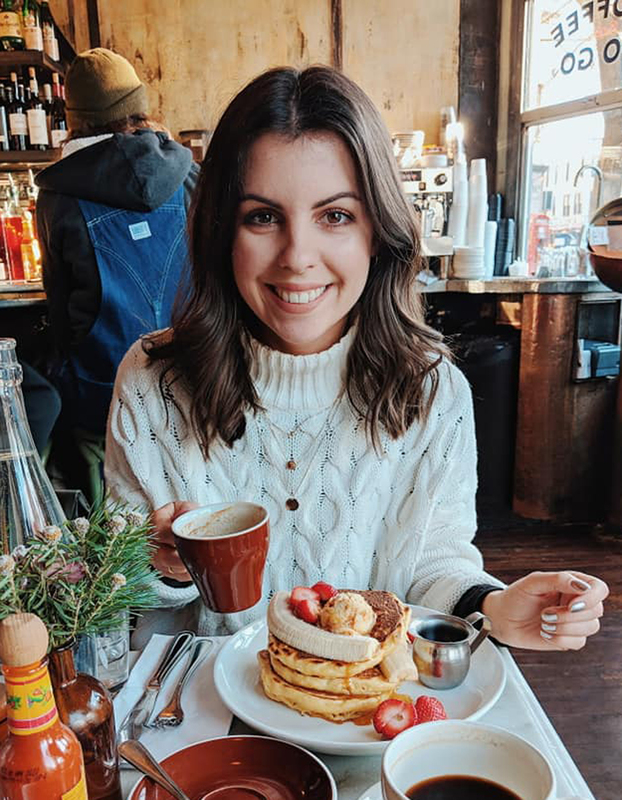 I often feature brands that give back in some way on my blog, and I am often fundraising for different charities, so this side of Leesa, really attracted me to them, and was something I wanted to shout about on my blog. There are a number of different brands offering similar charitable donations, from footwear to clothing, but I feel more brands could do the same, and it’s fantastic that a mattress company such as Leesa are paving the way for others. All Leesa mattresses are made in the UK and they offer a 100 night sleep trial, whereby if you are not happy with your mattress within 100 nights of purchase, they off a free returns service. Their expert team will come and collect your mattress, and either locate a nearby charity to donate the mattress too, or recycle it. Have you heard of Leesa before? Do you own a Leesa? If not, you can receive £100 off a Leesa mattress with my code SWEETMONDAY.